Marriott Cole was born in Los Angeles and raised in Pacific Palisades by her adoptive parents. After graduating from University of Oregon, she married her husband, John. Together they began a life of traveling through the USAF, the USANG, and Christian Broadcasting while raising their seven children. Besides writing Grace, Miracles, and Chocolate, Marriott has been a fourth grade teacher, a reading specialist, a lay midwife, a remodeler, a market researcher, and a two-bit extra in some movie scenes. Her greatest joy is her children and twelve grandchildren, as well as sharing the good news of what Jesus has done. Author Marriott Cole has experienced many miracles, big and small, in her lifetime. 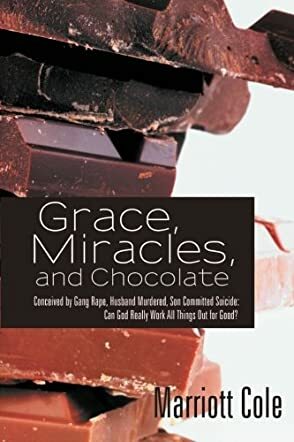 In Grace, Miracles and Chocolate she shares a collection of personal stories in 46 easy-to-read, digest and contemplate format. Throughout the book, Marriott beautifully conveys her steadfast love for Jesus and explains how her Christian faith has carried her through even the most difficult times in her life. This book is easily accessible to those who already believe in miracles, as well as those who might still wonder if miracles really can occur today. The smaller marvels she relays are whimsical and charming. The biggest miracles result from the most heart-wrenching tragedies a person could possibly endure. In relaying these events, Marriott nicely balances the dreadful details with the conquering power of faith. It’s hard to imagine how, without a steadfast faith, Marriott would have survived raising seven children, moving more than 20 times as an adult, losing her husband in a violent murder, and suffering the ultimate loss a parent can endure by losing her son to suicide. Marriott is forthcoming in admitting how at times her faith was indeed shaken. But, in the end, her solid foundation of faith is victorious every time. As someone who also trusts in Jesus and believes modern-day miracles still do occur, Marriott Cole’s accounts re-affirm and buoy my own personal trust in the Christian faith. Read these accounts and be sure to read the Conclusion in Chapter 47 where Marriott nicely ties up with a bow how she was able to not only overcome all that occurred, but to rise above it all and embrace and enjoy life again, and how we too can do the same.